Chapter 1 - A Bridge or a Tunnel. The River Severn, which has its humble beginnings at Blaenhafren, close to the Cardigan Bay coast, effectively ends at Gloucester where the river is only about 150 feet wide. Almost immediately, it opens into a tidal estuary of sand at low tide, while further down the river, the sand beds are replaced by rock in an area called the English Stones. Although at high tide the full width of the estuary is covered by water, at low tide the English Stones are dry for 1¾ miles across the river bed as the river flows rapidly through a deep rocky channel called The Shoots. The tides in the Severn estuary are the highest in Europe and are only surpassed in height by the tides of the Petitcodiac River in New Brunswick. The great rise of the tide is caused by the funnel-like shape of the estuary. As the tide runs around the South of Ireland, it becomes imprisoned between the South Wales and the Cornwall and Devon coasts. As the width of the channel gradually decreases, the tide is rapidly funneled towards the mouth of the River Wye, where a tidal rise of 50 feet can occur. The Great Western together with the Bristol and South Wales Railway had established a rail and steamship link between Gloucester and South Wales by the New Passage ferry in January 1864, but this provided no facilities for freight which continued to use the circuitous and steep gradient route through Gloucestershire. However, this was the time when South Wales began increasing coal production as more pits opened; in the Rhondda alone, twenty new pits would open between 1865 and 1875. 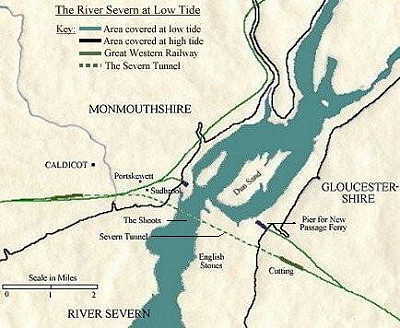 With economic pressures, several schemes were put forward for a crossing of the Severn as several railway companies vied with each other for the lucrative coal trade. The most popular schemes were crossings by a bridge as tunnelling was seen as a risky and unpredictable method. One scheme that was put forward was by John Fowler and Hamilton Fulton was for a high-level viaduct 2¼ miles long entitled 'The South Wales and Great Western Direct Railway'. Standing 120 feet above high-water level it was to have three openings, one of 600 feet and two of 265 feet. At a cost of £1,800,000, it was to be a formidable undertaking, however, the risks to shipping avoiding the bridge supports in addition to the mists and fogs of the estuary were hard to calculate. Nevertheless, the planning for this bridge, or 'Fowler's Line' as it became known, received parliamentary approval. At the same time, Charles Richardson, who with 25 years experience of tunnelling which included Box and Thames Tunnels, presented a case for a tunnel under the Severn. He argued that a tunnel would carry none of the risks of a bridge and it would cost just £750,000. 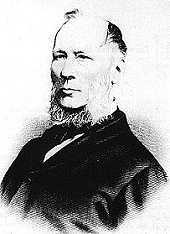 Before the Great Western gave their support for the tunnel, Richardson was asked to seek the approval of a distinguished engineer, to which John Hawkshaw came to Richardson's aid. Hawkshaw was responsible for not only some of the most difficult engineering works, but established the practicability of a tunnel under the English Channel, a model upon which all subsequent channel projects were based. With his backing to the scheme, the tunnel design was passed by parliament in August 1872. In his design of the tunnel, Richardson included cuttings at a gradient of 1 in 100 of which the cutting on the English side would be 60 feet at its deepest and 6,000 feet long. One danger that these cuttings produced was the prospect of being flooded by a storm and a high spring tide. These combinations had previously flooded the lowland area next to the estuary to a depth of 5 feet although theoretically the water could reach a depth of 11 feet. Richardson reasoned that the sea banks around the top of each cutting should be 16 feet high, and although Daniel Gooch, Chairman of the Great Western, later remarked that he thought that these sea defenses would hardly be necessary; later events were to prove otherwise.